This premium shell is loaded with copper-plated 00 buckshot to provide more uniformly shaped pellets than standard lead shot. The benefit to having uniformly shaped copper-plated pellets is that they deliver more consistent shot patterns time after time. 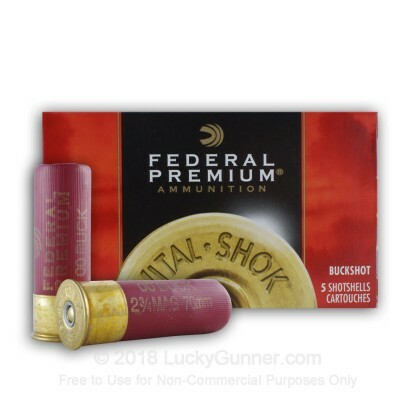 Federal's Vital-Shok load is constructed from Federal's patented spiral stacking process with a plastic shot cup and buffering to ensure dense hard-hitting patterns. 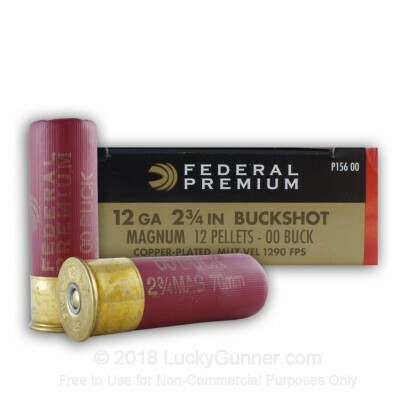 This shell loaded with 12 - 00 buckshot pellets is well suited for hunting medium sized game and also is well designed for personal defense. Federal Premium ammunition has been delivering on their promises since 1922 and continues to set the standard for excellence and innovation to this day.